On the day he assumed his new job as head of the US Interior Department (DOI), Ryan Zinke rode a horse through the streets of Washington. It seems only fitting now that we should find actual horseshit in the retired Navy SEAL’s office. Last month, Zinke, the man who runs 59 national parks and oversees more than 500 million acres of federal land, managed to squeeze in a half hour for America’s own shitlords, Chuck C. Johnson and Palmer Luckey, to discuss President Donald Trump’s plans for building a wall along the US-Mexico border. Johnson, you might recall, is the notorious troll who managed to secure a lifetime ban from Twitter after asking for funding to “take out” activist DeRay McKesson—far from the first time he’d harassed someone online. He’s also the founder of the highly partisan, often spurious, and achingly irrelevant GotNews. Johnson’s most recent belt-notch is the alt-right crowdfunding platform Wesearchr, a site which frequently experiences outages and is currently pooling money for the legal defense of neo-Nazi site the Daily Stormer. Though largely out of the spotlight, Johnson has repeatedly touted his own proximity to the Trump administration in recent months. 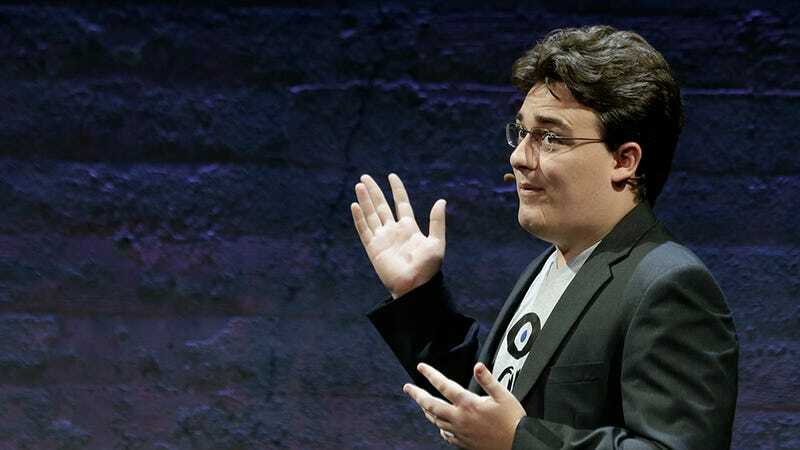 Luckey is, at this point, as well known for founding virtual reality company Oculus as he is for being slowly pushed out of it. It was revealed that the 24-year-old multi-millionaire had secretly funded an anti-Hillary shitposting political action committee called Nimble America with Milo Yiannopoulos as a silent partner; later it was discovered he’d funneled $100,000 to the Trump campaign after claiming he voted for Gary Johnson. Now, no longer employed by Facebook, Luckey seemingly spends his days getting into flamewars with Redditors. Neither of these men, to the best of our knowledge, has any particular expertise on wall construction, immigration, or policy, foreign or domestic. A log of Zinke’s meetings last month, published recently to the DOI website in response to several Freedom of Information Act requests, reveals that on April 12—between lunch and a briefing on DOI revenue streams—Zinke held a meeting with Johnson and Luckey on the topic of “Border Wall building plans.” Four other DOI employees, all of whom are Trump beachhead team members, were present for the meeting, including Megan Bloomgren, Zinke’s acting communications director. “The Secretary had a brief meeting where he listened to their ideas about using technology on the border and referred the gentlemen to the Department of Homeland Security,” a spokeswoman for Zinke told Gizmodo. Asked whether the Secretary was aware of Johnson’s “extremely inappropriate and abusive behavior” prior to the meeting, she said he was not.